Celtic wedding band is crafted in stainless steel and it features a stylized engraved knot-work design. 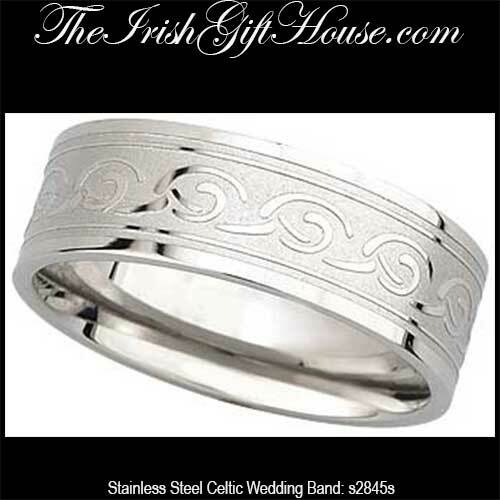 This Celtic wedding band, like all the Irish made jewelry at The Irish Gift House, is nickel free and hypoallergenic. This laser engraved stainless steel Celtic knot wedding band measures 3/8” wide and it features a continuous knot-work motif. The stainless steel band is made by Solvar Jewelry in Dublin, Ireland and it is gift boxed with a Celtic knot history card, complements of The Irish Gift House. Celtic wedding band is crafted in stainless steel and it features an engraved knot-work design.